A nanopore is a single pore a few nanometres in diameter. The team in the Cavendish are developing ways to use nanopores to detect single molecules of specific types, allowing the development of rapid diagnostic tests for diseases in plants, animals and humans, or the detection of medicines and other harmful chemicals in waste water. The researchers manufacture single conical nanopores in glass using a laser pulling fabrication process. By putting an electric voltage across the pore, changes in electric current can be easily detected and represent individual molecules moving through the pore. This allows information about a molecule’s size, shape, and charge to be measured. They have also developed a method to create a bar code of molecules attached to a DNA strand that acts as a carrier molecule. The bar code passes through the nanopore and leaves a detailed characteristic trace in the electric current. If specific molecules are present in the environment, these will then bind to other parts of the DNA strand and will also be measured in the changes to the electric current. The bar code system provides a way of categorizing which molecules are present in a mixed sample. 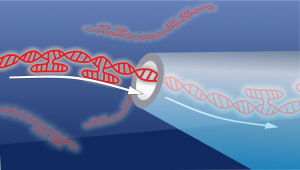 This technique therefore gives a test capable of detecting a large number of single molecules at the same time. It is also possible to gain information about the DNA itself, for example showing which types of bacteria are present and whether its DNA shows pathogenic characteristics or antibiotic-resistance. The question for the i-Team is to determine which sets of molecules and biomarkers the researchers should focus on, enabling the research team to develop the associated DNA bar code sensing system.